The State of Texas and City of Denton will not protect us so we must protect ourselves with a ban on hydraulic fracturing. We need all petition turned in by May 5th. If you feel you have collected all the signatures possible please turn in any signatures you have as soon as possible. We must to have the petition in to the City of Denton before the next election. If you need help getting your petition notarized or need someone to pick up your petitions please contact Cathy McMullen at dentoncountywellwatchers@gmail.com. 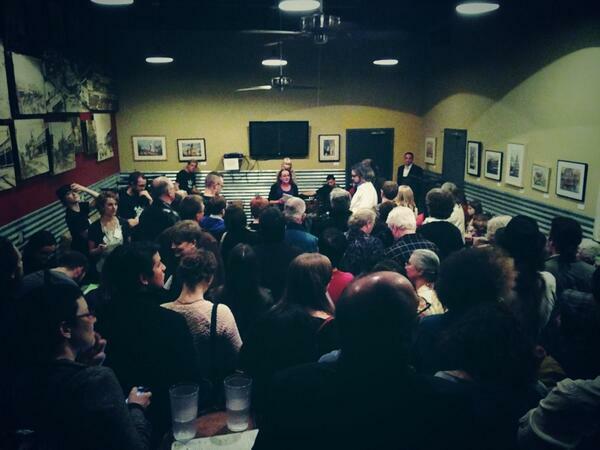 Above: A packed house waits to sign the petition to ban fracking in city limits of Denton, TX. Denton, TX (Mar 14) – Frack Free Denton today announced they have gathered substantially more than the required signatures to put their fracking ban initiative on the November ballot. Denton City charter requires signatures equal to 25% of votes cast in the most recent general election for an initiative to get on the ballot. Denton Drilling Awareness Group (DAG), which was formed by members of the city’s Drilling Advisory Group after their recommendations were largely ignored by the city, launched Frack Free Denton, the fracking ban signature drive on February 20, 2014. Denton city government, which supports fracking-enabled oil and gas development within city limits, has a track record of ignoring its citizens and giving industry a free rein. Decisions are made in closed sessions without citizen input. Yesterday, DAG released a short video (http://bit.ly/FFD-econ-video) demonstrating that Denton citizens are forced to weather the health and safety impacts of fracking-enabled oil and gas development without benefitting economically. “As far as I know, fracking companies can’t vote. It makes one wonder why the city is prioritizing fracking over Denton’s public health, especially since Denton residents aren’t really economically benefiting from fracking,“ said McMullen. Dan’s Silverleaf, 103 Industrial Street. Jazz, poetry, art, and rock n’roll all in celebration of community and Earth Day! Drinks and treats for all! T-shirt and stickers for sale. Did the Denton city council members who bragged about bargaining with Eagleridge during the “Standstill Agreement” know Eagleridge was planning to sell the residents of Denton out to the highest bidder? If there are any questions regarding the economic benefits of hydraulic fracturing in Denton this video presentation can answer some of them. A huge thank you to “Earthworks” who began a fundraising campaign for ‘Frack Free Denton’ today. “Earthworks is a nonprofit organization dedicated to protecting communities and the environment from the impacts of irresponsible mineral and energy development while seeking sustainable solutions”. You can donate at the link below or here on our website. Your donations will help continue this citizen’s initiative, making sure we get enough signatures and then enough votes to end hydraulic fracturing in the city limits of our home, Denton, TX.